The following is an excerpt from a book cited in full at the bottom of the passage, that briefly discusses the syncretic practices of some African Orisha worshippers on the island of Trinidad, who have come into contact with an absorbed elements of Hinduism into their practice. Trinidad does, in fact, have a sizable population of Indian origin, and this sheds a bit of light on another blended tribal / folk practice that may aid IndoPagans with leanings towards more tribal methods. 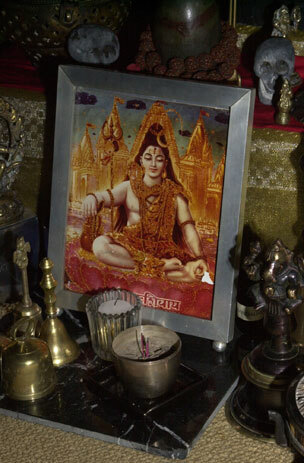 shrine a small area devoted to one or more Hindu deities. Hanuman or Mahabir, and Oshun and Ganga Mai. religious practices of the other. To view this article on its original page on the Lucky Mojo site, click here.